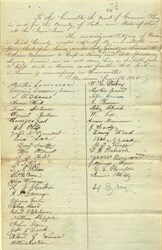 Historic Petition not to grant a Tavern License to William Merriman dated in 1845. This item has the signatures of the town's citizens and is over 164 years old. Unionville is an unincorporated community on the line between northwestern Harpersfield Township in Ashtabula County and eastern Madison Township in Lake County in the U.S. state of Ohio. Unionville is the site of the land office of the Connecticut Western Reserve.